Spark teamed EF up with Taylor Swift for a successful international cross-promotion. On Valentine’s Day, GRAMMY Award winner Taylor Swift and EF International Language Centers gave three EF student fans a unique Valentine’s gift: a trip for two to Paris, including a meeting in person with Taylor Swift and an evening enjoying her concert. To enter the competition, participants filled in a mini quiz about Taylor Swift’s song lyrics and Parisian culture at ef.com. On Valentine’s Day, 14th February, EF drew three lucky winners who went to Paris and invited a friend of their choice to come along. 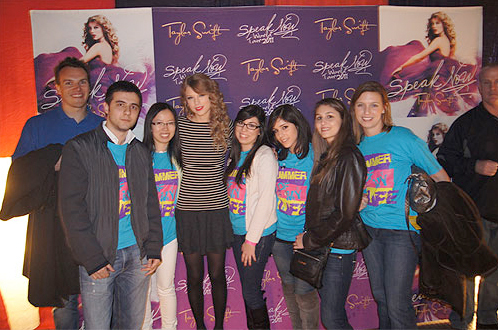 The winners’ trip took place in March to coincide with Taylor Swift’s concert on the 17th of March in Paris. There were also 100 other Taylor Swift prizes to win including signed copies of her album, “Speak Now”. The multi-platinum selling singer/songwriter from Nashville was touring 18 countries with her third studio album, “Speak Now”, including singles “Mine” and “Back to December”. EF Education First ran the competition in 43 countries around the world via social media and selected mailings and emailings. Spark set up all aspects of the cross-promotion between EF Education First and Taylor Swift.